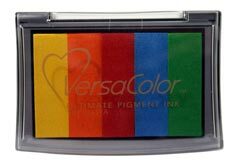 Versa Color the ultimate pigment ink great to use alone or with embossing powder. and non toxic. Available in full size pads and 1" cubes.